Why get a Super NES Classic when this $40 console plays every NES and SNES game ever? People are going nuts trying to find Nintendo’s new Super NES Classic console in stock anywhere. Good luck… it’s not going to happen unless you’re willing to cough up some extra cash to get one on Amazon. But seriously, why bother when there’s something better out there? 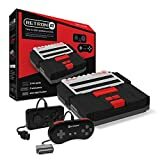 The Hyperkin RetroN 2 Gaming Console for SNES/ NES plays every single Super NES and original NES game cartridge out there. In fact, it even plays Famicom and Super Famicom games. Why go crazy looking for a Super NES Classic with just a handful of games when this Hyperkin console exists?